So here we are, saying Good-Bye to February....can you believe it, March already?? I mean, I know February is the shortest month of the year but come on MARCH.....ALREADY??!!!?? And March is jam packed this year, we've got Daylight Saving Time begining on March 10th so we need to remember to "Spring Ahead". Of course everyone knows March 17th is St Patrick's Day, the day when everybody's Irish. March 20th is the first day of Spring and then this year Easter falls on March 31st. WHEW!!!!! What a month. On Saturday March 23 from 9am-12pm Bob's Big Boy Norco is holding a Tractor and Truck Show featuring JET CADET a 60 H.P. Jet Turbine Engine Tractor. Entry to this show is FREE and their address is 3521 Hamner Ave, Norco, 92860. If you are interested in participating in this show or one of their upcoming monthly shows you can contact Charyle via email at trollady10@aol.com. On Sunday April 21 it's time again for one of the biggest events throughout the year, Fabulous Fords Forever at Knott's Berry Farm. This is a huge show and I highly recommend this one as a must NOT miss. You can keep updated on their Facebook page at www.facebook.com/FabulousFordsForever or I will of course have more info as the show gets closer. On Sunday May 19 is the 13th Annual All Chrysler Car & Truck Show & Swap Meet hosted by the Inland Mopar Car Club at the California School for the Deaf in Riverside, located at 3044 Horace Street, 92506 from 8am-3:30pm. I would suggest this show to anyone who is looking at getting started in particpating in shows. pre-registration is open until May 1 and you can contact me for an entry form. Also, if you are interested in participating in the swap meet portion of this event you can contact them via email at l_pietro@csdr-cde.ca.gov Looking towards Summertime, I've got 2 shows in June that you might be interested in. On Saturday June 22 is the 6th Annual Charity Car Show for JDRF at Cucamonga-Guasti Park and on Sunday June 23 is the 37th Annual 40 Ford Day Car Show in La Palma Park in Anaheim. I have entry forms for both of these shows so you can come by our location and pick one up. 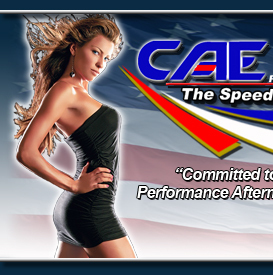 Of course, if you've got a car show, boat event or race coming up and would like to get the word out, just email me at caeperformance@aol.com with all of the details and I'll include it in my weekly newsletter. Or you could just stop by and drop off some flyers for our counter customers. And you can alsways check out our website at www.caeperformance.com and see a full listing of the months events, just click on the EVENTS tab and choose cruise nights, car shows or races. If you'd like to connect with us on Facebook just go to our website HOME page and click on the FACEBOOK icon. You can also watch videos from previous car shows by clicking the YOUTUBE icon which takes you to our YouTube channel. And if you know someone that you think would enjoy getting my newsletter just have them go to our website and fill out the "SUBSCRIBE" box on the HOME page. Hope you all have a great weekend and enjoy this great weather that we're going to have.